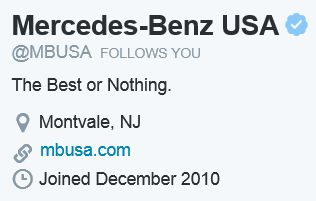 I’d like to thank Mercedes Benz USA for following my personal account on the Twitter. Little bit late to the party but staff forgive you on My behalf. – I noticed that when it rains the car gets wet. Do you know if this is normal or is it something I should be concerned about? – When I get into the driver’s seat I have noticed that the engine does not turn on unless I press the button. – Perhaps connected to the previous point, after arriving at a destination the engine does not switch itself off. It’s almost acting like some sort of machine that does not have any awareness of My needs. – I find the climate control quite pleasing, is there any way that it can be linked to what I see out of the windows and windscreen? It would be lovely if I turn the temperature up and then, for example, the trees that are before Me are replaced with palm trees and such things. Surely with today’s technologies we can do this? Perhaps call Steven Spielbergs? – One last thing, is there anyway you can get the nice lady that speaks on the voice control system to address Me personally? It would be really great if when everything switches on she says, “Hello GOAT”. Anyway, not sure how long I’ll be in Indian Wells but if you could get someone over to Me by the weekend that’d be great! If I’m on court please get your guy to head on over to Larry Edison’s office. His Grandfather invented the light bulb apparently. Who knew? Hello Sir GOAT, Your confessions cheer me up almost as much as Your magnificent, masterful displays on court. Please keep this up. From a #humble fan of Yours, thank You. Great of All Times, thee speakth my language 🙂 I am delighted.